Not only are they partial to a drink and have been proven to enjoy cooking, chimpanzees have also been found to share the human trait of communicating by smiling, according to University of Portsmouth researchers. Their study shows chimps and humans have even closer evolutionary ties than was previously believed. The university further found that, like humans, chimpanzees can create ‘silent smiles’ without a laughing sound. Scientists filmed 46 chimps at the Chimfunshi Wildlife Orphanage in Zambia, where cameras tracked the primates’ facial expressions. 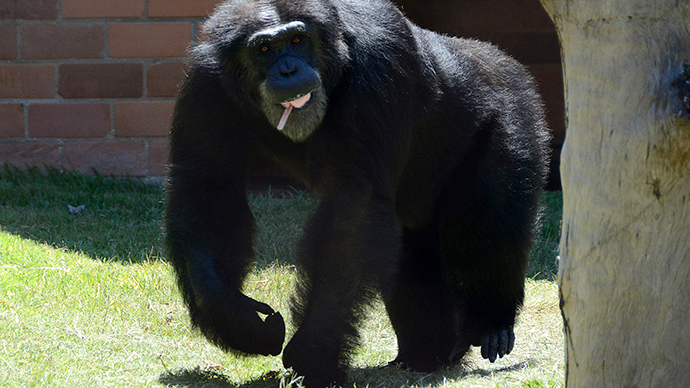 Their movements were analyzed by a facial coding system called ChimpFACS. Dr Marina Davila-Ross, from the University’s Centre for Comparative and Evolutionary Psychology, said the ‘silent smile’ trait allowed humans and chimps to communicate in many more ways than other animals. The team also examined the types of smiles which corresponded to particular laughing sounds, and found that in many cases they matched the human laugh/smile combination, showing that the two species must have inherited the trait from a common ancestor. The study also found that ancestral apes had the capability for flexible facial expressions – i.e. smiling – thousands of years before humans evolved. Chimps and humans are estimated to share roughly 96 percent of their genetic material, making the two species more closely related to each other than either of them are to apes or gorillas. Before the final sequencing of the human genome it was estimated that humans and chimps shared over 99 percent of genetic material. Humans and chimpanzees evolved from a common ancestor between 6 and 8 million years ago, analysis of DNA has shown.